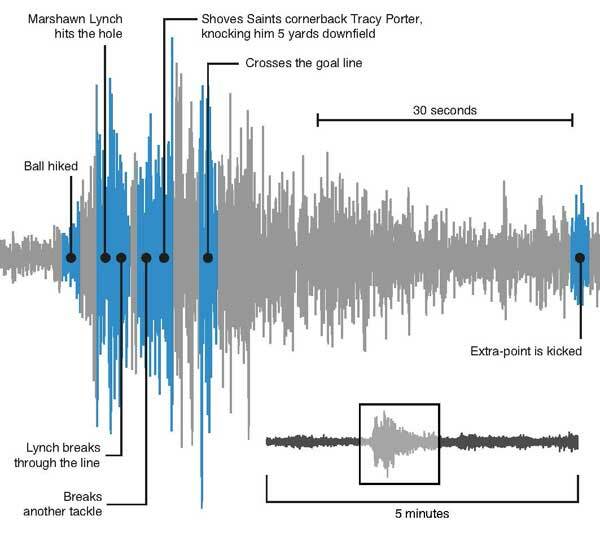 Marshawn Lynch of the Seattle Seahawks takes the phrase ‘Rumbling’ to the end zone to a whole new level. This became clear in a 2011 home playoff game vs. the Saints when Marshawn abused, humiliated, and destroyed the New Orleans defense on his way to a 67 yard touchdown with an astonishing 9 broken tackles. Even more impressive than what NFL films calls arguably one of the best runs in NFL history, is the aftermath. What do you do when you see an amazing play or touchdown? If you are like most, it is usually some combination of screaming/yelling until it hurts, spinning around hunting for high 5’s like Tom Brady, and jumping up and down like a Super Mario Brother. Well this 68,000 person mosh pit of fans loosing their minds along with some insignificant geological factors like soil density, proximity to the shore, and other scientific mumbo-jumbo, contributed to what some have estimated as an earthquake in the magnitude of somewhere in the 1 to 2.0 range at the nearest seismometer, across the street from the stadium. 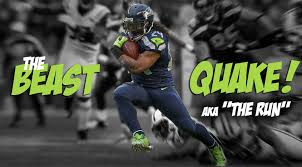 From that run the term “Beast Quake,” a reference to Marshawn’s nickname “Beast Mode,” was forever engrained in the vocabulary of football fans not only in the NW, but all over the globe. The YouTube highlight of this human-powered seismic event has over 2.1 Million views. In preparation for this seasons matchup scientists from the University of Washington’s, Pacific Northwest Seismic Network installed 2 seismometers at CenturyLink Field, appropriately named ‘Hawk 1 and Hawk 2.’ Their hope is to collect more data on the phenomena of the human-powered earthquake. They were not disappointed, the next game garnered ‘Beast Quake 2.0,’ which was said to be even stronger than the 1st.